I remember trumpets. Trumpets and cornets, trombones, a sousaphone, various horns — lots of clashing brass. They must have been recorded, played over the sound system: certainly in no accounts that I’ve read of that night is there a mention of a live orchestra playing a fanfare after every Leaf goal. They wouldn’t have blared it for the first few, I don’t think — only after events turned historic would they have started it up. It was very loud — too loud, I remember my dad advising me. That’s about it. Thirty-six years ago tonight my dad and I were at Maple Leaf Gardens to see the famous game, Leafs and Boston Bruins, wherein Darryl Sittler scored six goals and assisted on four others, setting records that not even Edmonton’s Sam Gagner could break last Thursday night. It’s not a lot, but that’s what I’ve got. February 7, 1976. I was nine years old. I do recall we were sitting on the west side of the Gardens, maybe half way up. I think I remember being a kid among adults every time we stood up to cheer Sittler, looking at taller people’s backs and heads, struggling to see. That could be a generic memory from any number of other Leaf games I’ve seen, though — or Toros games, because we went to a lot of WHA games, too, in those years, come to think of it. I was just as happy watching Tom Simpson and Vaclav Nedomansky as I was Lanny McDonald and Borje Salming. 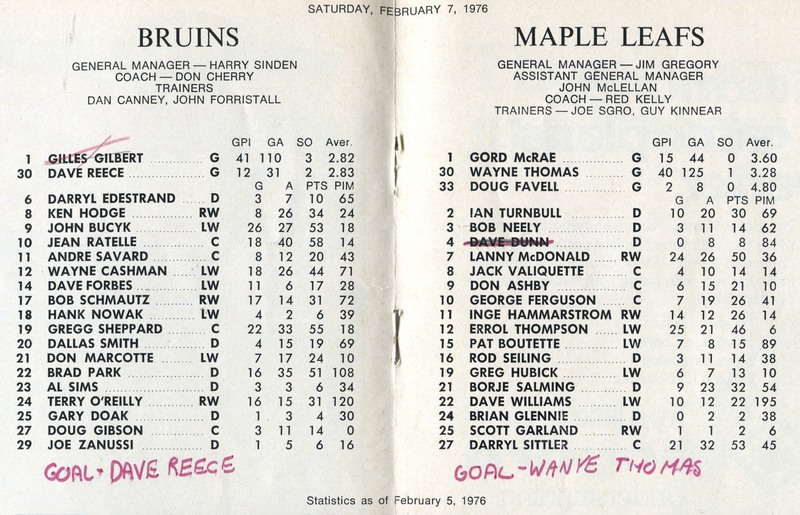 It was a pretty good Bruins team that night: Jean Ratelle, Brad Park, Terry O’Reilly, Johnny Bucyk were all on the ice. Nursing a knee, Bobby Orr wasn’t. 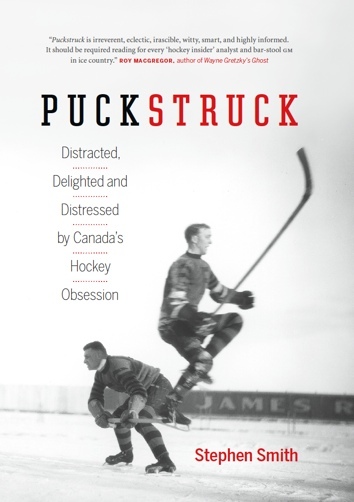 The goalie was, of course, Dave Reece, who played the whole game and never another in the NHL. Somewhere today someone will be calling him to ask how it felt, what he recalls. I hope his memory is as dim as mine. It wasn’t Sittler’s fault. What was he supposed to have done? He has the only known videotape of the game, Joe Bowen was saying on the broadcast of the Leafs-Oilers game last night. I wonder if today at home he’ll take a quick look back? He’s also got a whole February 7 chapter in Sittler (1991), the autobiography he wrote with Chrys Goyens and Allan Turowetz. Which has been a big help for me. When Sittler recorded his eighth point in the first minute of the third period, tying the record held jointly held by Rocket Richard and Bert Olmstead, he had 19 minutes to break it. “And everyone in the building knew it.” Okay! Good! We went crazy, apparently. Every time he touched the puck after that, our decibels went way up. At teammates of Sittler’s we yelled: pass it! Errol Thompson finally did and Sittler scored. We went nuts. The ovation went on forever. Sittler got the impression that we wanted to stop the game and have some sort of special ceremony then and there. That’s what Sittler writes in his book. Did we? Sure. Fine. Why not? If you say so, Darryl. As it was, he had to wait a few games, when Harold Ballard and NHL president Clarence Campbell presented him with a silver tea service. I still have the program from the game to go along with my fanfare memory. 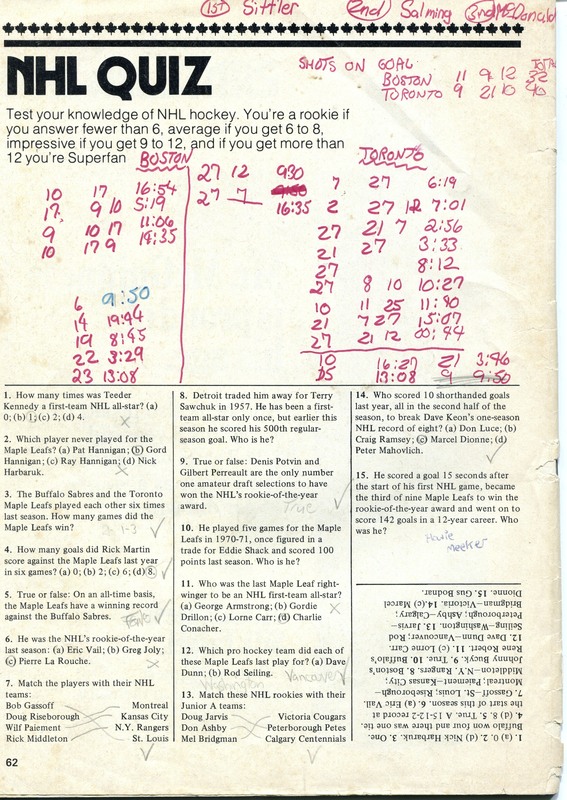 I don’t want any of Darryl Sittler’s limelight for myself, I promise you, but just for the record, I did score 8 out of 15 on the backpage NHL Quiz that night, and no-one is ever going to be able to take that away from me. More on Sittler’s big night here.